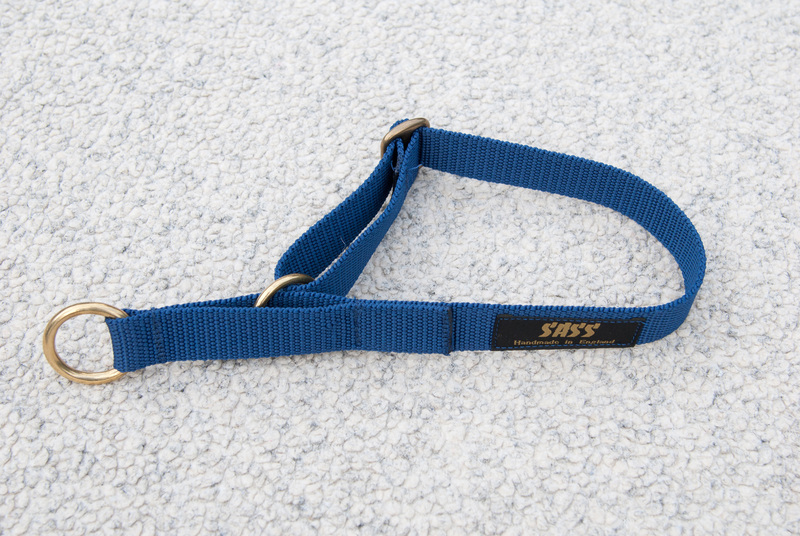 We have two sizes of collar to suit virtually any breed. As all of our products are handmade we can accommodate special sizes too. Attach a clip lead or a ring lead to the solid brass ring on the end of the collar. The collar will tighten by 8cm ( over 3 inches ) when dog pulls on the ring. In this way it acts like a semi choke but without a chain. It can’t over tighten and because there is no chain there is no sudden click to alarm a nervous dog. It is very comfortable for the dog. Available in 10 webbing colours. Just choose the correct circumference for your dog from the 2 options below.